Here are some practical and design-forward feeding sets for babies, the Bamboo Suction Plate with Spoon from Avanchy features 3 sections and a silicone suction attached to the bottom for a balanced meal. The Bamboo Stay Put Suction Bowl with Spoon is a deep bamboo bowl with a silicone suction attached to the bottom. Bamboo spoons and forks with silicone heads are also available to help you every step of the way from starting solids to fork training! To secure this to the table, simply firmly press it to the flat surface. When you need to remove your baby bowl, simply lift up on the easy-release tab and it'll pop right up. A simple and smooth design, it'll also provide comfortable and convenient mealtimes for everyone involved. This is a great feeding set for a baby. The silicone suction helps secure the bowl to the table, helping keep messes down because it won’t be sliding all over the table. The set's silicone-based airtight locking mechanism is also easy to activate and remove, so you won't get frustrated trying to get the bowl off the table when baby's finished eating. The silicone spoon is a very thoughtful detail because the silicone head is great for helping soothe teething gums. The ergonomically designed bamboo handle fits both adults and baby hands, making it easy to hold and smooth to the touch. 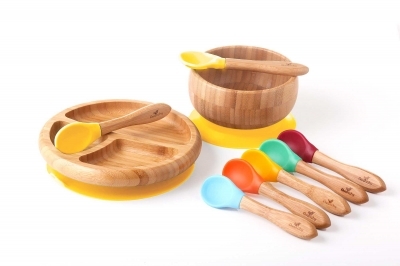 The Bamboo Stay Put Suction Bowl with Spoon from Avanchy is for ages 4 months and up. It will ease the transition to solid foods for babies and the spoon's silicone head is a great way to help with this adjustment. It also gives them something to teeth with. Parents are also going to like this bowl not only for its suction functions, but for the teething and smooth design features as well.